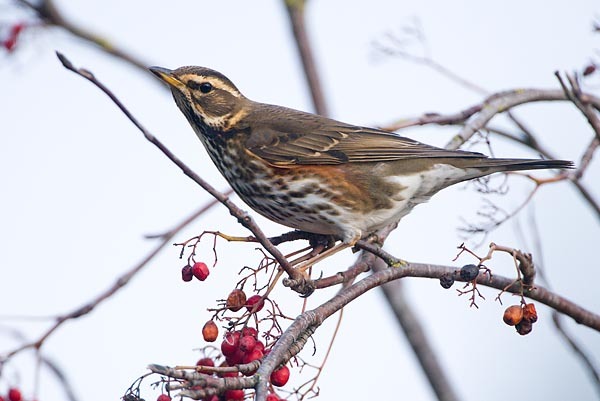 The migration of most passing redwings and song thrushes usually ends with October but this autumn it may rather be a little later. Only a few individuals stay to winter here. The redwing thrushes are the smallest of our thrushes, but, together with the slightly larger song thrushes, also the most numerous and most often encountered. They manage quite well in urban parks, cemeteries and gardens and inhabit deciduous as well as conifer woods. Autumn food is all kinds of berries. Song thrushes mostly feed on the ground and even mushrooms go into their menu now. The redwing is characterised by its cream-coloured eyebrow stripe, missing in other thrushes, and the rust-coloured flanks and underwings. Male and female are alike. When excited redwings and song thrushes behave similarly: flap their wings and clatter with the beak. On the ground all thrushes move in jumps. The plumage of the song thrush is modest. 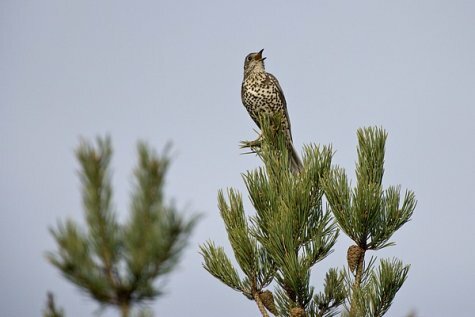 Upper parts greyish brown, underparts yellowish and white patterned with the typical thrush streaks; both sexes have a similar plumage. We can expect them back at the end of March and onwards.